World class science standards, and much more. NOW, inexplicably, the Redistricting Committee of the GOP-controlled Texas legislaturehas a vicious plan DESIGNED TO DEFEAT THESE CONSERVATIVES in the next election. Fact: The Texas Republican Party has more than a 2/3 majority in the Texas House of Representatives. Fact: The Texas Republican Party has nearly a 2/3 majority in the Texas Senate. Fact: The Texas Republican Party controls every statewide office and position, including the Governor’s mansion, the Lt. Governor, and the Attorney General. Stunning Reality: Liberals and Moderates (Republicans in Name Only—RINO’s) are in control of key parts of Texas’ government and are making significant history-changing and future-impacting modifications to voting districts in Texas. Due to the every-ten-years’ census, redistricting of many important voting districts is in progress statewide. While redistricting is a legislative responsibility, the SBOE was asked to agree to a proposed legal redistricting plan that accommodated the census data and only moved three counties statewide. However, in an apparent “back-room-closed-door deal,” the latest redistricting plan being put forth by Rep. Burt Solomons’ Redistricting Committee openly attacks and in some districts, guts conservative influence on the SBOE. In an unannounced and un-vetted move, the Redistricting Committee has ignored the advice and consent of the SBOE from which the committee duplicitously asked for input and consent. At about 10:00 P.M. Tuesday night, 3-29-2011, the SBOE members (who serve voluntarily and with no paid staffs) were told via email that their input to the Redistricting Committee had been ignored, and even the very plan (101) that had been put forth to them and the public as THE plan had been unceremoniously dumped (and in all likelihood was nothing but a diversion anyway). The new plan, crafted by Rinos-or-Democrats, not only does almost nothing positive for conservatives (which, as despicable as gerrymandering is, would be nominally expected with a 2/3 GOP controlled legislature), but also inexplicably goes out of its way to actually hurt most conservative SBOE members. Most importantly, the new plan (107/111) that was passed out of committee late on Friday, 4-1-2011 as CSHB 600 (the CS means “committee substitute”) ultimately hurts our state’s conservative values. The attack by the Speaker Straus-appointed members of the Redistricting Committee (many of whom do not have conservative voting records) targets specific conservative SBOE members who have ushered in a new era in Texas education by adopting new, wildly popular-with-parents English, phonics, science, history, and social studies standards. For instance in K-3 English classes, students will be taught to read by phonics, to spell correctly, and to use good handwriting in their written work. I seriously doubt that punishing the conservative members of the SBOE who worked so hard to adopt the new K-12 standards for our Texas students is what the Tea Partiers and conservative Republicans had in mind on November 2, 2010 when they threw out big government, big spending Socialist Democrats and Rinos by the dozens across the nation AND IN TEXAS! The “back story” on Charlie Garza’s district is that it is a designated Department of Justice (DOJ) “minority” district—designated under various lawsuits as a district that must be a Hispanic district. Charlie Garza, a decorated U.S. Navy Submariner-turned-professional educator, won the district in a heated battle with long-time Socialist Democrat René Nunez, supposedly a real estate agent who had no real education expertise or service to the nation. Charlie Garza has both! However, the mostly moderate-to-liberal ruling class (who in spite of 2/3 majorities by the Texas GOP, still obviously rule Texas — or think they do), were incensed that a “DOJ designated minority district” would go GOP. Wait a second. Isn’t Charlie GARZA a minority? To state the obvious, he is Hispanic! Isn’t Charlie Garza, who served this country honorably for over two decades in the U.S. Navy and for eleven years thereafter as an educator, a worthy candidate and public servant? However, it has been leaked by a staffer on the Redistricting Committee itself that the reason Charlie GARZA’s district was changed is that he was the wrong kind of Hispanic; and according to the committee, their preferred candidate (not Charlie) had to have his district protected. Just let that sink in for a moment or two before you get totally outraged and start the Second American Revolution. The vaunted Redistricting Committee, appointed under Speaker Joe Straus, evidently feels Hispanics MUST be represented by a liberal Socialist-Marxist-redistributionist-pro-Obama Democrat. Apparently, a solid military career, a second admirable career as a professional educator (both as a classroom teacher and administrator), being ELECTED and actually BEING a Hispanic is not good enough. The ruling elite have decreed that District 1 MUST be represented by a liberal Democrat of their choosing. But, as they say on TV commercials, “There’s more”. Not only did the ruling oligarchy decree that Charlie GARZA was not the right kind of “minority” (is this even relevant any more when 70+ per cent of the district is Hispanic and Garza was ELECTED by the district in 2010? ), but they also decided to help proven moderate compromiser, Bob Craig of Lubbock, as well. (West Texas should be ashamed of how Bob Craig votes, but we’ll save that for another day.) They took Ector County, literally the home of the most likely challenger to Bob Craig in 2012, and moved it out of Bob Craig’s district. 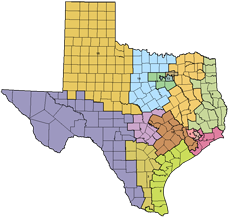 Then they moved Midland County, (typically conservative Republicans) from Charlie Garza’s district into Bob Craig’s district, with the intent of destroying Charlie Garza’s chances of being re-elected to the SBOE in 2012. Similar shenanigans were played out in other districts also. Lobbyist Thomas Ratliff has consistently misrepresented publicly what the hard-working SBOE members (particularly his opponent, Don McLeroy from Brazos County) did to adopt new Social Studies standards. Unfortunately, anti-incumbency Tea Party voters not knowing at the time who the “good guys and the bad guys” were on the SBOE, swept Don McLeroy out of office and elected Ratliff. CSHB 600 removes Brazos County from Ratliff’s district so that Don McLeroy (if he so desired) could not run against Ratliff in 2012. Ironically Thomas Ratliff is presently under Texas Attorney General Greg Abbott’s scrutiny since Texas law CLEARLY says that paid lobbyists cannot serve on the SBOE. Ratliff is not only a paid lobbyist, but he works for Microsoft that does business with the Permanent School Fund under the authority of the SBOE. This is a clear conflict of interest. In yet another vicious move, a very unusual looking configuration on CSHB 600 conspicuously juts down into the Alamo Heights region of Bexar County (San Antonio). This obviously is meant to help a 2012 challenger to beat former legislator Ken Mercer who is a conservative warrior on the SBOE. All of this mucking up of the SBOE redistricting map has been done in a supposedly Republican Legislature. Is this what the GOP does when it is in control? Bottom line: The Soviet Union’s Joseph Stalin once famously said that it doesn’t really matter how people vote but rather who counts the votes. Gerrymandering, the kissing cousin to Stalin and others’ cheating schemes (especially when done under the auspices of a GOP Texas legislature to eliminate conservative and volunteer State Board of Education Members) is not much better than Stalin’s vote counting. While gerrymandering IN ANY FORM is BAD, it is being done by GOP members to destroy GOP members and advance progressive, redistributionist, revisionist history liberal agendas. This must not be tolerated! I should not even have to write this. We elect conservatives and we expect them to behave like conservatives and protect our conservative interests. Our conservative legislators, for whatever mundane reasons, dropped the proverbial ball on the redistricting of the SBOE. This is not the time for all of us Texans to be “Mr. Niceguy.” This is serious business because all of our public school children and educators are affected by the decisions made by the elected SBOE. Let them know in no uncertain terms that hurting the conservative volunteers on the elected SBOE is NOT TOLERABLE and that Legislators will be held accountable in November 2012 if they vote for ANY redistricting plan that hurts our conservative SBOE members. For those of you who may have seen “Fireproof,” there is a scene early in the movie where firefighters and bystanders spontaneously pull together to save a car wreck victim from certain death as a train approaches. While we must all pick our battles, I submit that the future of Texas schools is well worth your fighting for! Please jump in and help “move the car” on this one. We really need to pull together on this. Call and fax now. Then tell your friends and relatives to do the same. The Texas State Board of Education is a joke all over this great nation!!! Since retirement, I have worked as a seasonal employee of one of our national parks. I serve in a capacity that meets guests from all over the United States, and I receive numerous questions about the idiocy of the Texas SBOE, especially dealing with the Social Studies TEKS that have been developed by this fine ship of fools. The stance that this group of representatives has taken does not shine a favorable light on the great state of Texas from anywhere across this nation. Most of the people just laugh in my face when I try to explain what goes on in the educational arena of this state, and I am a retired educator from the public school system. The language arts TEKS are insane, and the social studies TEKS are downright embarrassing. At least my grandchildren will have a whole new twist of social studies that are lacking in the current version because I will be "homeschooling" them after school in a broader interpretation of government and history than that reflected in the "dumbdowned" version of what is offered by the SBOE!! Not true, Anonymous. The board is attacked by Unions, Communist and Progressives for insisting the truth about American History be taught to our children. It is funny how these attackers never mention specifically WHAT they are against. Their ONLY goal is to replace the Board with anti-American activists who, with lies and half truths, will teach our children to hate their country and their heritage and to support their subversive agenda. The Board only speaks to what must be included in the curriculum. Things like the Constitution, the founding fathers and American Exceptionalism. What is wrong with telling our children the truth about what happened in 1776? It doesn't fit with the "new" facts being presented by those that would destroy our Republic. Oh yes - children also must learn we are a Republic and not a democracy and that certainly doesn't sit well with the Cloward and Piven groups behind this. To them, the ends justify the means and only a brainwashed group of what Stalin called "useful idiots" (and what we call children), can do their dirty work for them. So Anonymous, who are these people that come to our state, strike up a conversation with a “Seasonal Employee” in a State Park then proceed to trash our SBOE? And they specifically mention Social Studies TEKS, do they? That is amazingly unbelievable. You are the perfect illustration of WHY we need the SBOE we have.